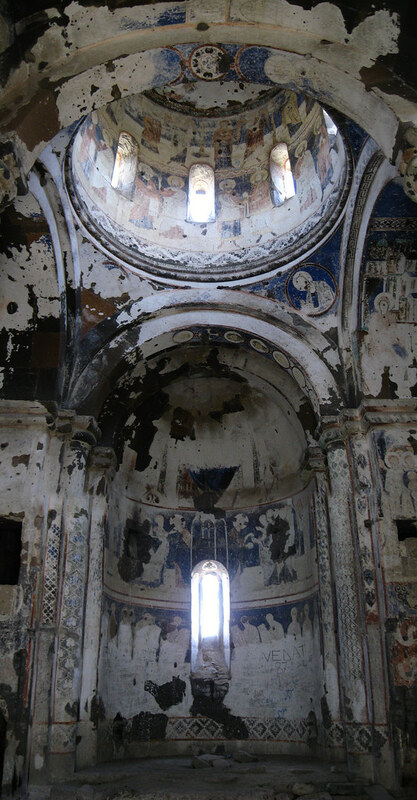 Abandoned by its once prosperous and powerful inhabitants, it is situated on the Turkish side of a militarised zone between the border of Turkey and Armenia. 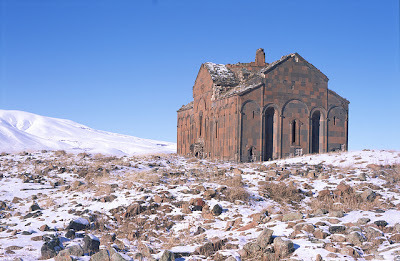 The city of Ani is no stranger to death, destruction and desertion. The city is the victim of a colossal and centuries old struggle for power between various factions in the region. 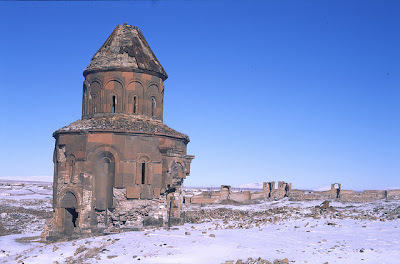 Founded in the fourth or fifth century AD the following millennium saw Armenians, Kurds, Georgians, Mongols and Turks struggle for and ascend to power in the city-state. Almost each time a faction rose to power the city was ransacked almost to the point of obliteration. 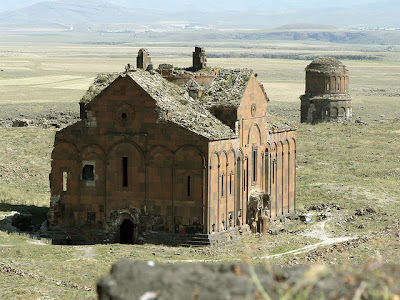 Ani finally wheezed its metaphorical last breath by the middle of the eighteenth century, exhausted to extinction, as it were, by the constant struggle for supremacy over its dominion. 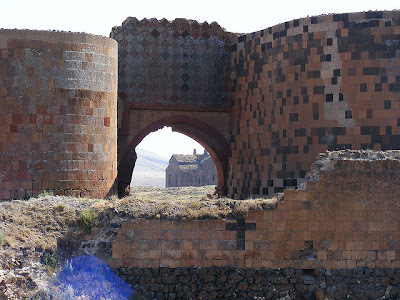 The city was originally Armenian and the territory on which it stands is still disputed between modern day Turkey and Armenia. 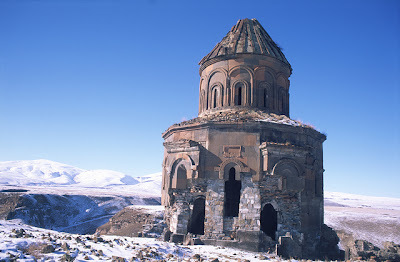 It was first mentioned in the annals of the Armenian Kamsarakan dynasty in the fifth century AD. 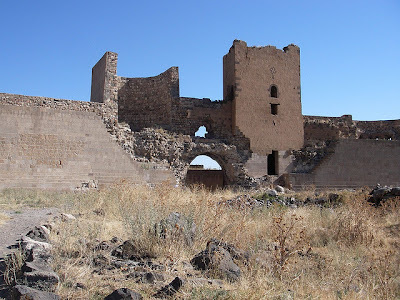 They were one of the seven great houses of Parthia and their origins went back to the Persian Arsacid – a major Iran based power. 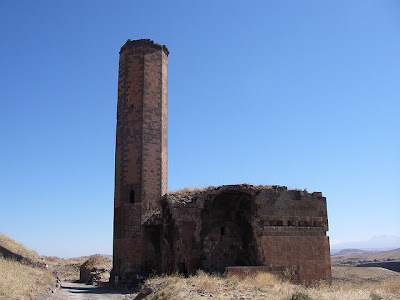 The name of the city seems to have come from Ani-Kamakh, an Armenian fortress but was also known as Khnamk though historians do not really know why. The best suggestion is that it comes from the Armenian for to take care of. Certainly, the city was designed for just that – to protect and shelter its citizens. It is situated on a triangular plain. At its height it must have been an extraordinarily visually striking sight for approaching visitors. Chosen for its naturally defensive situation, to the east it is protected by a ravine and river, to the west a steep valley. 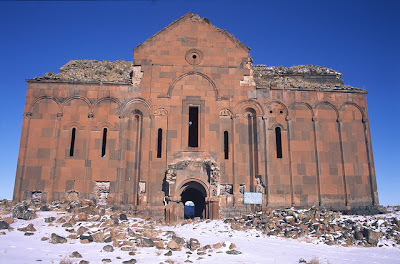 The early ninth century saw the decline of the Kamsarakans and they were replaced by another Armenian dynasty, the Bagratuni. 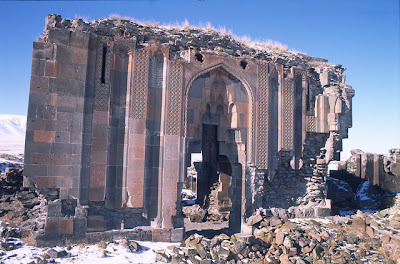 Their leaders referred to themselves as ishkhan or princes and they ruled over perhaps the most peaceful period of Ani’s history. 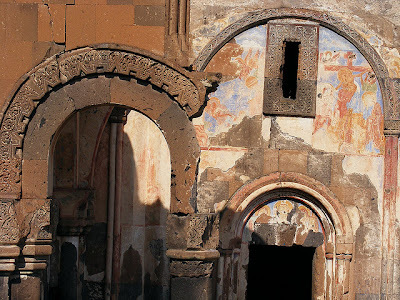 A pivotal point for the success of the city came in 992 when the head Bishops of the Armenian Church moved their sear to the thriving city state. Its population doubled within a century, which while not remarkable in modern terms must have seemed like a golden age of growth for the Bagratuni. 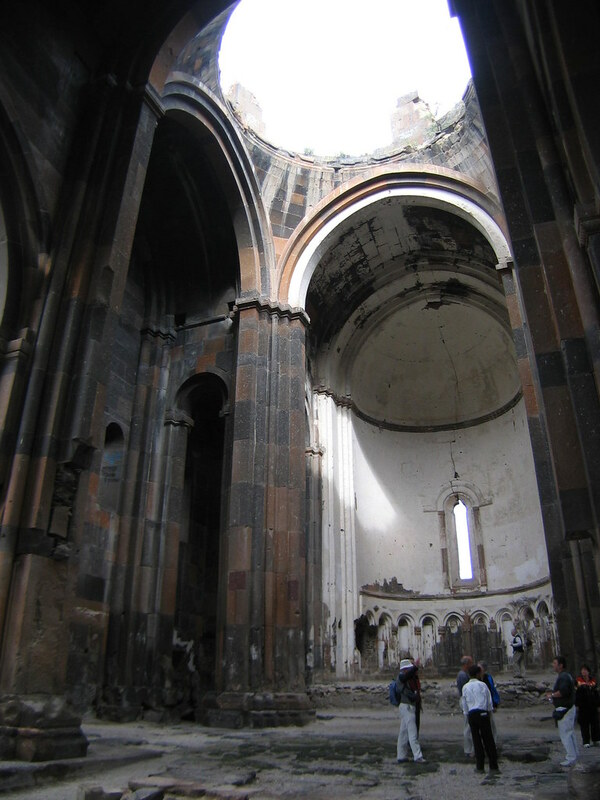 A pair of quarrelling siblings would start Ani’s protracted but inexorable decline. 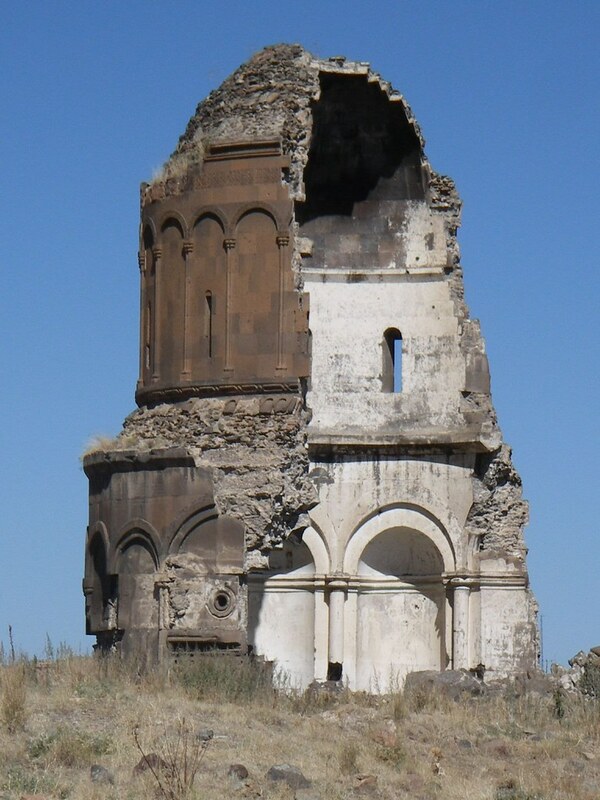 When King Gagik I died in 1020 neither of his sons would defer to the other and so the kingdom was split apart. 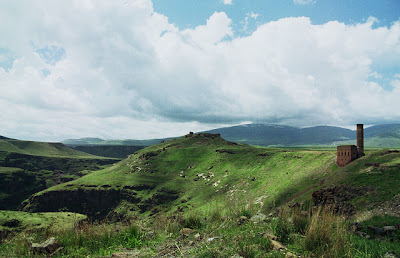 The older, Hovhannes Smbat took over Ani and the younger, Ashot, the rest of the Bagratuni principality. Hovannes Smbat wanted and needed peace in his time so struck a deal which meant just that but would have terrible long term consequences for the city. He knew that the neighboring Byzantine Empire regarded his lands with envious eyes and that slowly and surely they were drawing plans against him. So he did something quite remarkable. 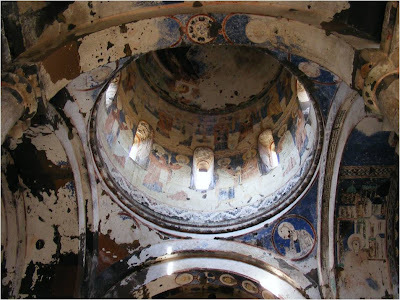 To avoid invasion he promised his kingdom after his death to the Byzantine Emperor, Basil, and made him his heir. When Hovannes Smbat died in 1041, Basil’s successor, Michael IV, obviously wanted what had been promised and claimed sovereignty. 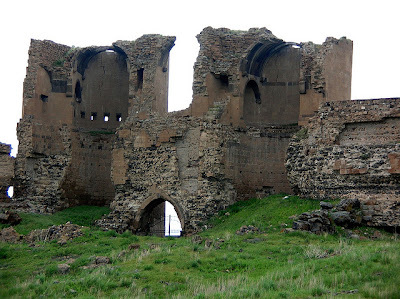 The new King of Ani, Gagik II, was having none of this and managed to fight back no less than three armies sent to capture the city. 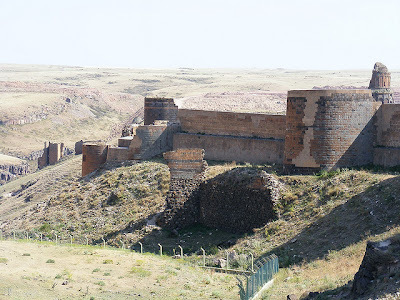 However, the still living Ashot was captured and although he had never been king of Ani, this final humiliation led to the surrender of the city. 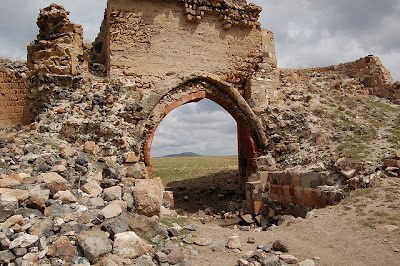 So, in 1045 Ani became a Byzantine city, together with a Greek governor. It was now part of what people called The New Rome. Not for too long, however. 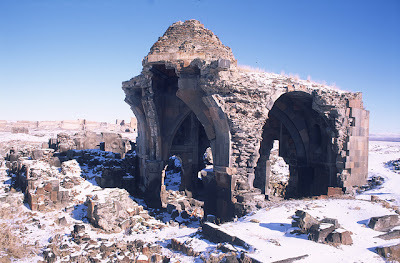 The Seljuk Turks had other ideas for the city and in 1064 the army of their Sultan, Alp Arslan (aided by the Georgians under King Bagrat) laid siege to the city. The blockade lasted three weeks. As a more modern saying goes, we are as a society only nine meals away from anarchy so although three weeks may not seem a long time, the conditions within the city must have been horrific. Worse was to come. Once the city was captured, Sultan Alp Arslan ordered the complete and total slaughter of the population. Yet that was not the end of Ani. 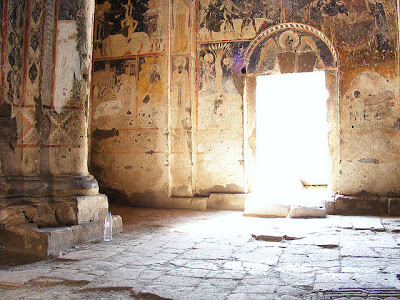 Many of the Armenian population had escaped the slaughter through fleeing before the siege and slowly and surely they returned. The Sultan eventually became disinterested in the city and sold it, lock stock and barrel to a Muslin Kurdish dynasty known as the Shaddadids. 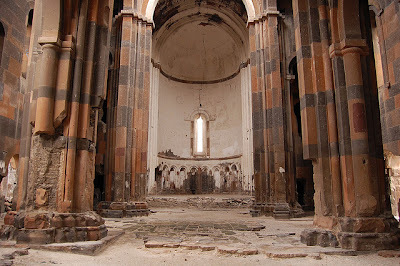 The 1001 churches would be joined by mosques. 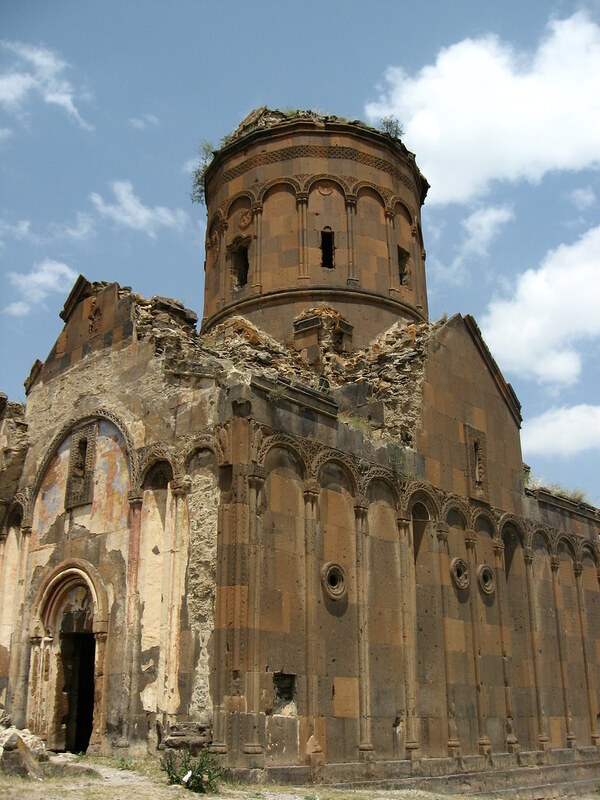 An uneasy peace settled between the overwhelmingly Christian and Armenian population and their new Muslim overlords. Generally the Shaddaddis attempted through a process of conciliation and intermarriage with the Bagratid nobility (who were still around!) to keep that peace. They had to – each time the population felt that they overstepped the mark in terms of governance they appealed to the neighboring (and Christian) kingdom of Georgia for help. The Georgians were happy to oblige. They invaded and held the city not once or twice but three times (1124, 61 and 71). Each time they would chastise and punish the Shaddadids while eventually releasing power back to them. 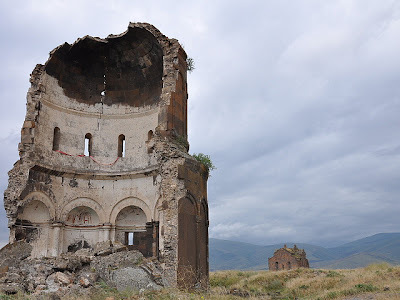 It was not a happy time for the Armenian population. Eventually the Georgians, under their legendary Queen Tamara, took final and decisive action in 1199. 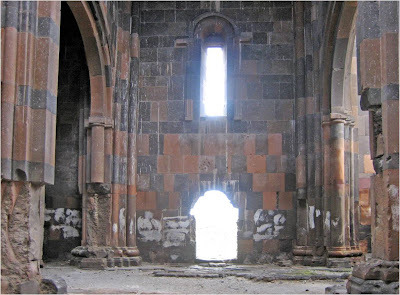 They removed the Shaddadids permanently from power and gave governorship of the city to the Armenians. These successors of the Bagratids formed a new dynasty, almost three hundred years before Columbus reached America, naming it after their General and founder, Zakare and calling themselves the Zakarids. Wealth, trade and prosperity returned to the city. Yet mayhem and massacre was only a generation away – from yet another new enemy. 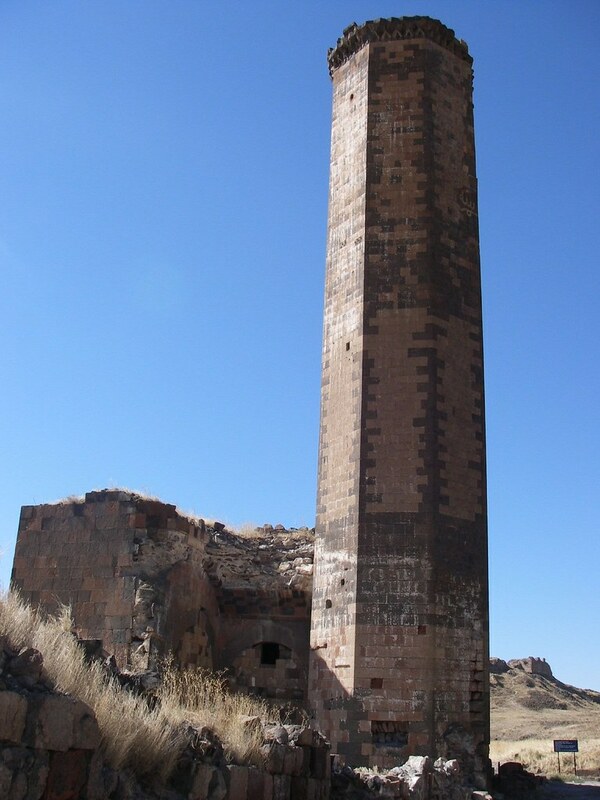 In 1236 the Mongols captured Ani and put a large percentage of the population to the sword. 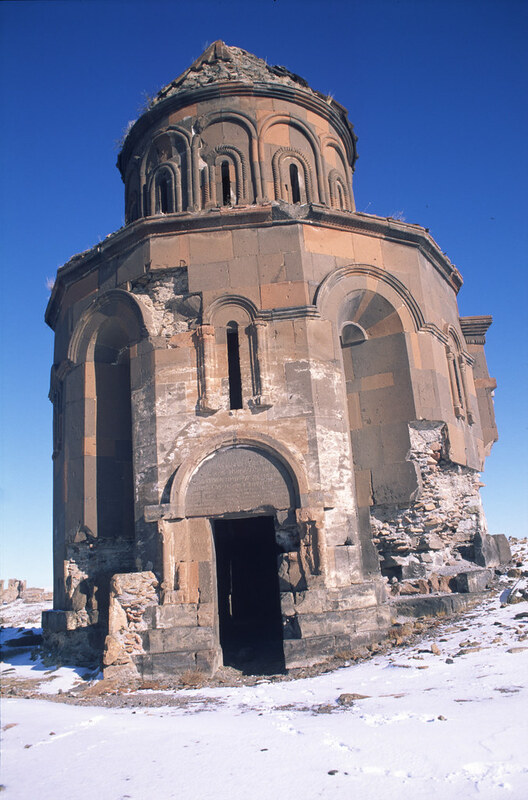 The Zakarids were allowed to continue to rule but as Mongol rather than Georgian vassals. It was here that the decline of the city started to gather momentum. 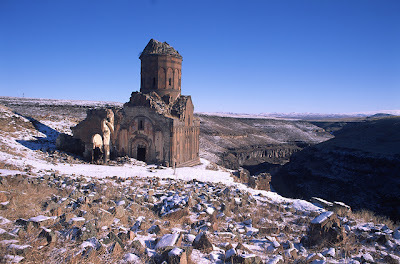 By the fourteenth century the city came under the control of a series of Turkish dynasties. 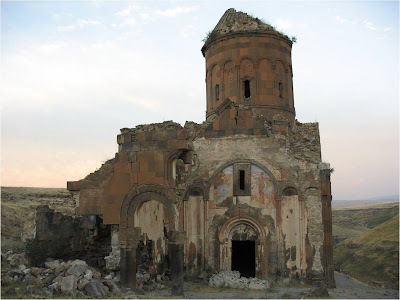 The Armenian bishopric left in 1441 and in 1571 the city came under the control of the Ottoman Empire which consistently neglected it. The small population that persisted for some time after was itself gone by 1750. 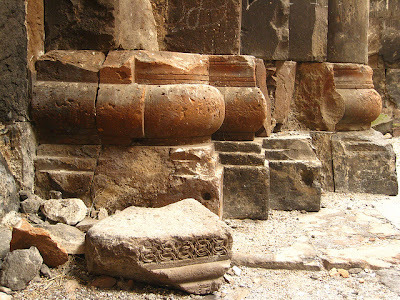 The city was ‘rediscovered’ by archaeologists during the next century. Several excavations took place but further damage would be done after the First World War. 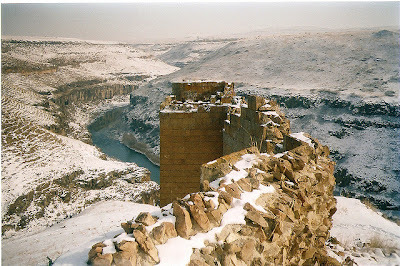 Turkey and Armenia continued to militarily fight over territory until 1921 when Ani, much to the chagrin of the Armenians, was contained within the borders of Turkey. 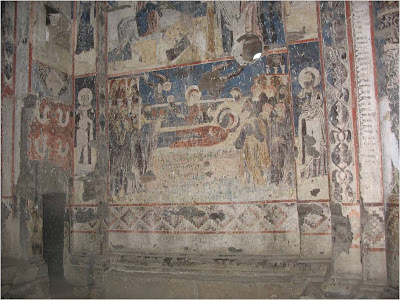 The neglect this valuable archaeological site suffered at the hands of the Turkish authorities can hardly be called benign. 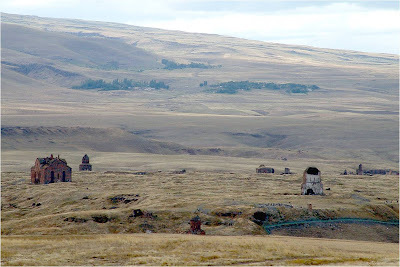 In May 1921 the Turkish Assembly sent a message to the commander of their Eastern Front, authorizing that the "monuments of Ani be wiped off the face of the earth". Although this did not happen completely, it is to Turkey’s shame the order was ever give and the following decades of neglect only add to that. 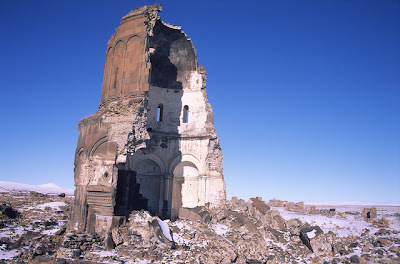 The Global Heritage Fund, as recently as October of 2010 reported that Ani is "On the Verge" of irreparable loss and obliteration, citing inadequate management and looting as the main causes. So sad to see all that art work wasting away.